The bathroom design trends we expect to see in 2014 focus on comfort, aesthetics and detail. Small half baths and powder rooms are becoming more inviting for guests. Master bathrooms are being designed as a private retreat with optimized space and spa features. 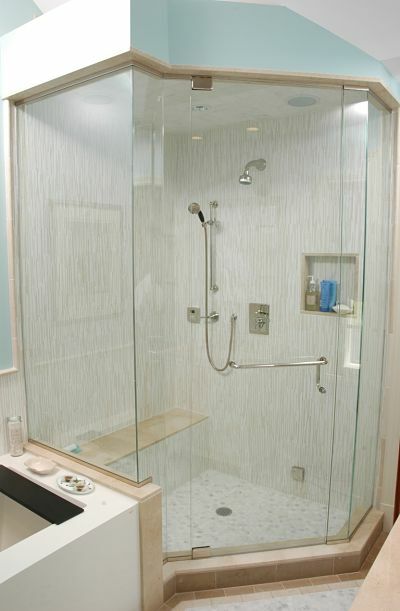 Walk-in showers are customized to better fit the space in a room and to provide more comfort for users. 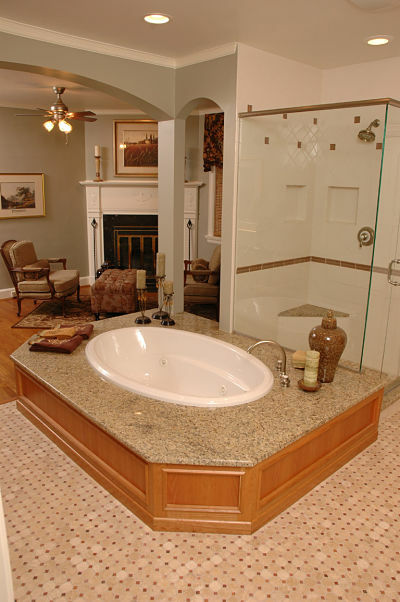 Homeowners are paying close attention to details, including safety features in baths. “Universal Design” principles are being incorporated into bath remodeling plans to make the room accessible for users of any age, body type and ability and to avert accidents. There is also a trend toward simplicity that favors transitional and contemporary interior design elements. Here are nine of the best bathroom design trends you’ll be seeing in the Greater Cincinnati area this year. 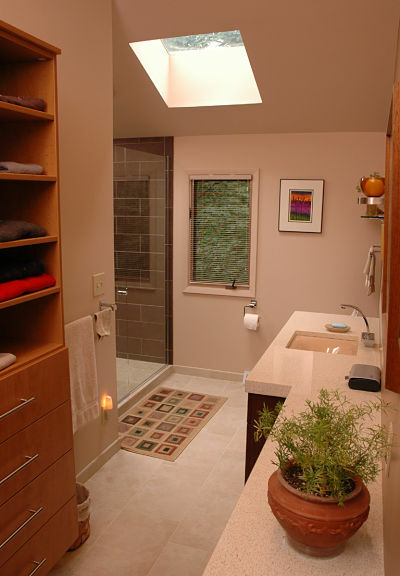 Bathrooms are often small spaces and simple clean lines in design make the room appear more open. Slab front and Shaker-style cabinets are timeless. Waterfall edge and straight miter edge counters complement the linear styling of a room. Streamlined hardware, faucet fixtures and uplights serve as accents. One of the reasons this trend has become so popular is that it is sophisticated and practical. Sleek surfaces, the use of larger tile on floors and walls are attractive and easy to maintain. Linear elements are seen in the shower, linen storage cabinet, glass wall shelf and flooring used in this bath. A half bath is a place to make a design statement. These small spaces can be embellished with vessel sinks or pedestal sinks, beautiful counter surfacing and wall finishes and stylish tile. 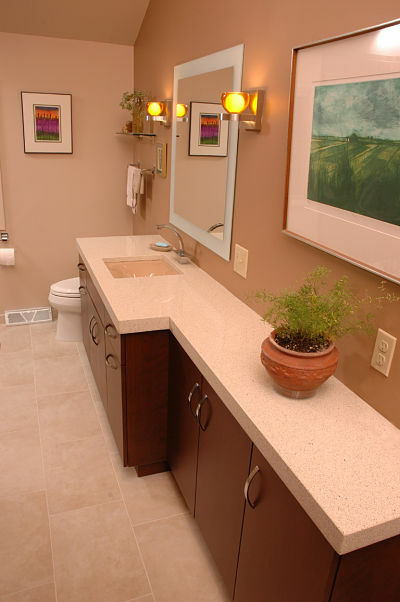 Comfort height toilets are being used in half baths along with elegant faucet, light fixtures and mirrors. 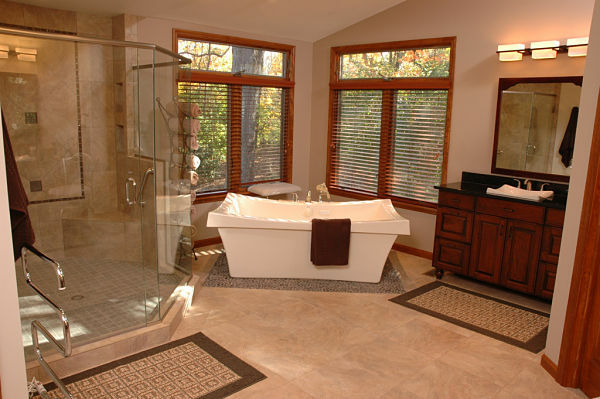 A master bathroom is a personal retreat. Remodels are focused on adding luxury, comfort and optimizing the space. Some remodels achieve this by adding on to a home. Others involve reconfiguring the interior and perhaps adding the space of an adjacent closet, hallway or bedroom. This master bathroom remodel involved capturing space from an adjacent closet, hall and bedroom to add a luxurious tub, walk-in shower and expanded vanity. 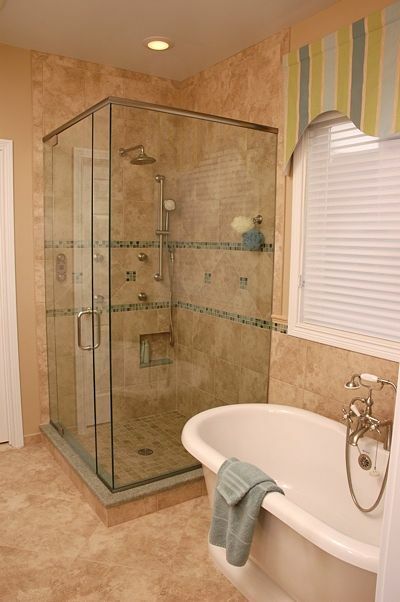 One of the most desired features in bathroom remodeling is a walk-in shower. Some homeowners will even forego a tub in favor of an easy to use walk-in shower with a bench, multiple showerheads and other amenities. Walk-in showers can be customized to fit a space as small as 3-by-3 feet, installed in a corner or irregular floor space or integrated with a tub. They also can be fashioned without doors for aesthetics and easy maintenance. A custom doorless walk-in shower with 12-by-12 wall tiles that make cleaning a breeze. Spa features are trending and include multiple showerheads, wall jet sprays and steam baths. Other spa features may include a fireplace in the bathroom, sound systems, heated towel racks and flooring, and a TV screen built into a mirror. 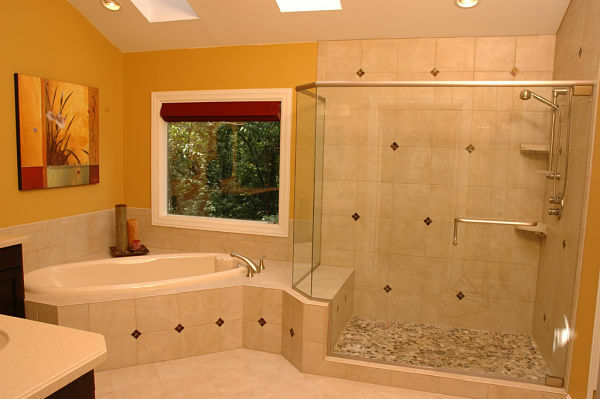 Soaking tubs continue to appeal to homeowners. Free standing tubs come in many shapes and styles from popular footed tubs to pedestal base tubs. Free standing tubs cam be installed away from a wall and allow for versatile placement. Some are ergonomically designed for comfort. Hand held shower attachments make bathing a pleasure. A sleek free standing pedestal base tub is placed under a window and near a glass enclosed walk-in shower. The homeowners chose to extend the wall tile to the area behind the tub to resist splashes. 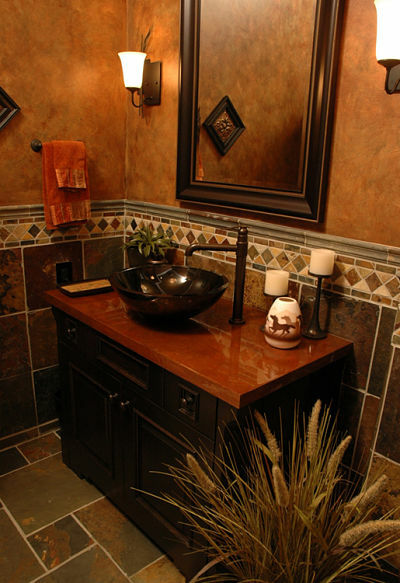 Bathroom tile should be functional, easy to clean and beautiful. Floor tile set on an angle can create an illusion of space in a room and glass tile accents can add a touch of “bling”. 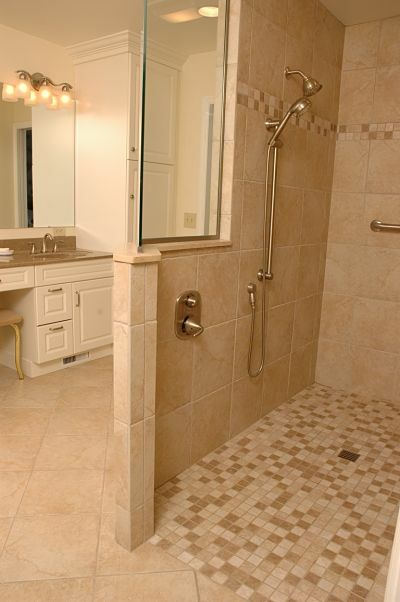 In showers, small mosaic tile helps to create a slip resistant surface. Large tiles use less grout and are easier to maintain and can be used for both walls and flooring. 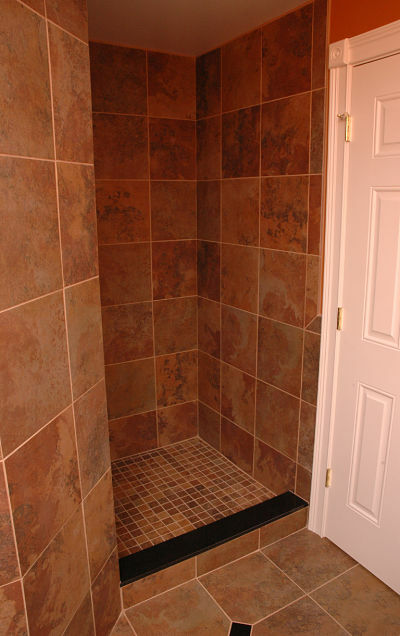 Large 12-inch tiles are used for the surround of the shower and tub. Small mosaic river rock tile is used on the shower floor and the shower wall includes glass mosaic tile diamonds as an accent. The floor tile is set on a diagonal in the room. This year, neutral wall colors are being used throughout the home. In a bathroom, shades of gray, beige, tan and light blue complement many of the fixtures, cabinet finishes, counter surfaces and popular tile products used in interior design. These colors provide a sense of serenity in a bathroom. The walls of this luxurious master bathroom suite are painted gray to highlight the architectural elements and create a calming, peaceful interior. This bathroom has a 5-foot turn radius, a curbless walk-in shower, a shower seat, lowered controls, slip-resistant flooring and a handheld shower.